1. Falling TVs send a child to the ER every 30 minutes! The number of kids injured by a TV falling on them grew 125 percent between 1990 and 2011. TVs can injure or even kill kids and pets when placed on dressers and stands. Kids are naturally intrigued by colors and sounds. They will climb up on furniture to get closer and touch the TV when unattended. A few rocks back and forth and your TV, along with your child may be headed straight to the floor. 2. 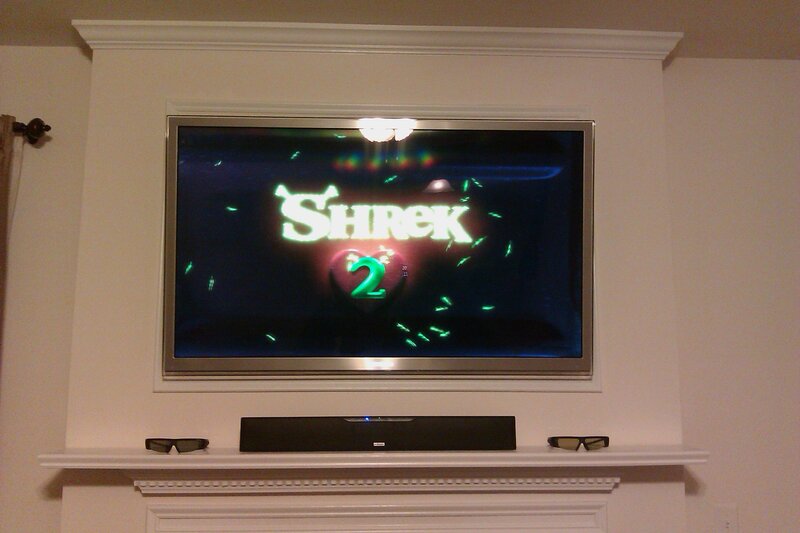 Wall mounting your TV lengthens its life. How? Wall mounted TVs require you to use the remote. No more pressing the buttons on the TV causing possible damage or, worse still, tipping it over from rocking back and forth. 3. More space in your home. Especially if you’re concealing components in a closet or cabinet. 4. Better viewing angle. Wall mounted TVs offer more options for viewing angles and glare reduction as opposed to watching the TV sitting on a stand. 5. Wall mounted television sets are more theft proof. Table-top installed TVs are easy targets during home invasions because they are high-priced, easy to sell, and easy to carry. Theft of wall mounted TVs is very difficult and very time-consuming because of lag bolts and mounting brackets attaching the TV to the wall. 6. We have been doing this for years. We carry all the necessary tools to complete most installations in less than an hour. The cost of our tools, TV wall mounts and your hours of labor are more than compensated for with our affordable pricing. Plus, you have the peace of mind knowing that your kids can sit right underneath the TV and eat a bowl of cereal on the floor if they like. 7. Apart from safety, experience is the number one reason. 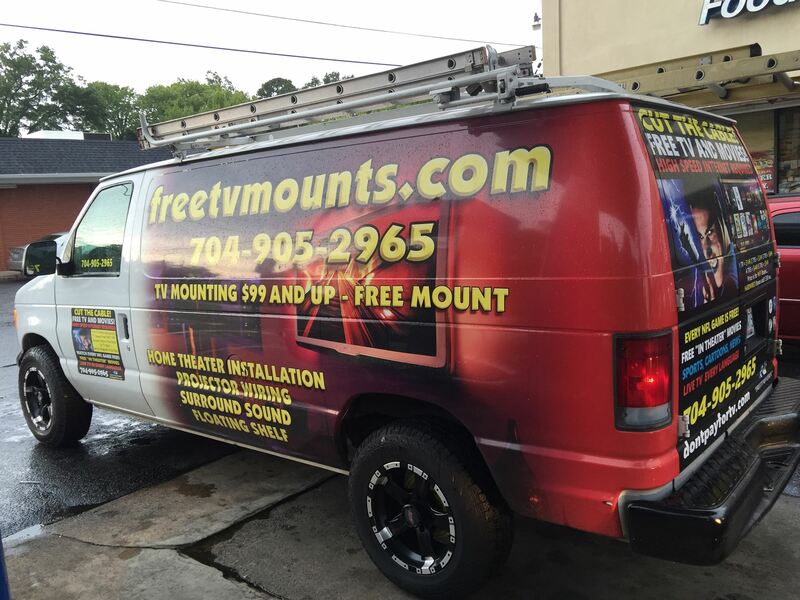 We have installed more than 20,000 televisions and monitors since we began our TV mounting service in that beat up old red Safari minivan years ago. 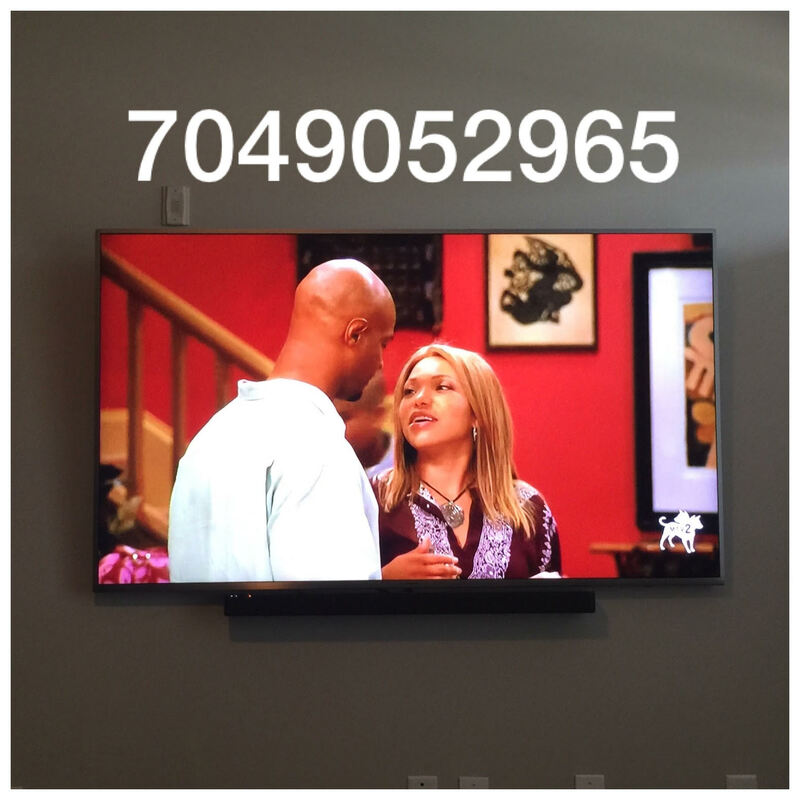 With your trust and loyalty, we have become Charlotte’s top choice in professional TV wall mounting and home theater installation. 8. Attention to detail and warranty. 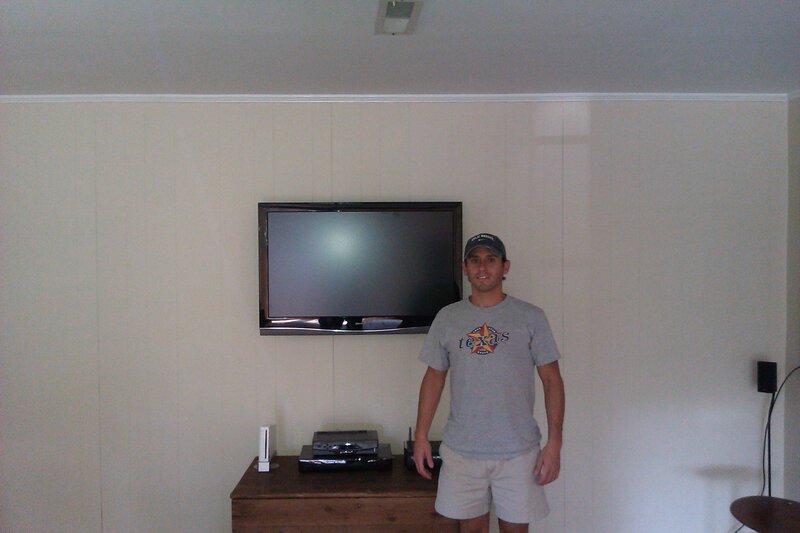 Our technicians ensure that each installation supports a minimum of twice the weight of your TV or we will not hang it. Every installation comes with a LIFETIME “NO FALL WARRANTY”. We guarantee every one of our TV installations. 9. Safety. Most amateur TV installers will mount the TV too high and may install wiring that will void your home’s warranty, cause it to fail safety inspections and possibly even catch on fire. 10. Maintain your home warranty. Fishing your TV’s factory power cord in the wall is illegal and a fire hazard. 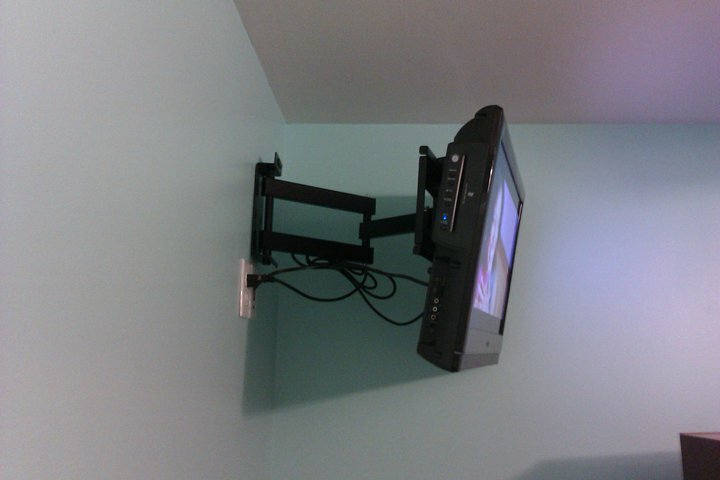 We install a power bridge behind every TV wall mount installation to ensure it is up to electrical code. We hide the audio/video cables in the wall when possible to ensure your TV installation is not only functional but pleasing to the eye and a compliment to your beautiful home. Service Record i.e. Have they had any TVs fall off the wall? Has The TV Installer Undergone a Back-ground Check? What Sizes And Types Of TVs And Monitors Do We Mount? In our experience, 32-inch to 80-inch flat screen TVs and monitors are best for wall mounting. Anytime a customer is considering purchasing a TV larger than 80 inches, we strongly suggest purchasing a high-definition projector. This not only cuts space needed for installation, but with our home theater installation prices you can cut costs as well! We install high-definition projector and screen systems capable of producing stunning high-definition 1080p and 4k ultra high-definition home theater pictures from 70 inches up to a stunning 300 inches! 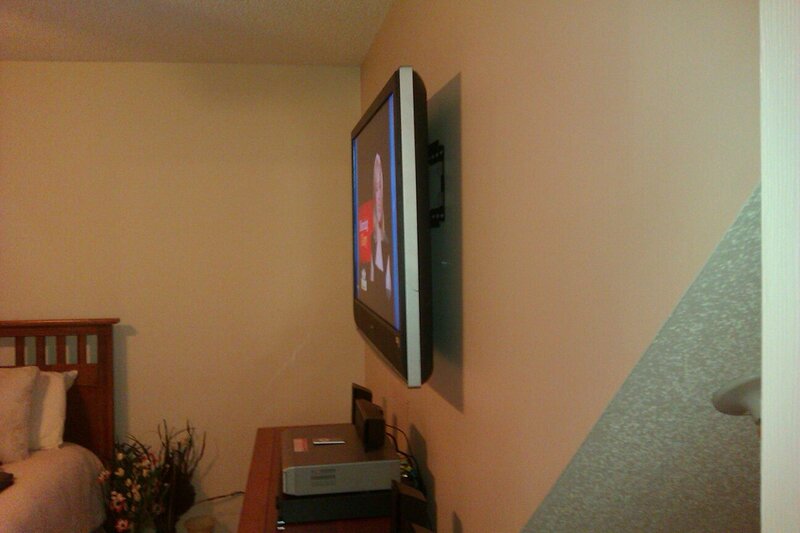 We offer a FREE tilting TV wall mount and a 15-foot HDMI cable with every every TV installation. 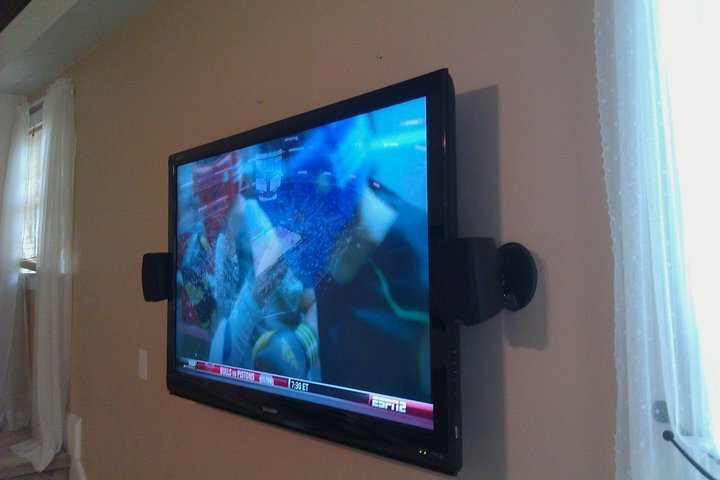 Our professional TV mounting service starts at only $99 with the wall mount included. All of our TV wall mounts are constructed with 100% unbreakable heavy-duty steel. 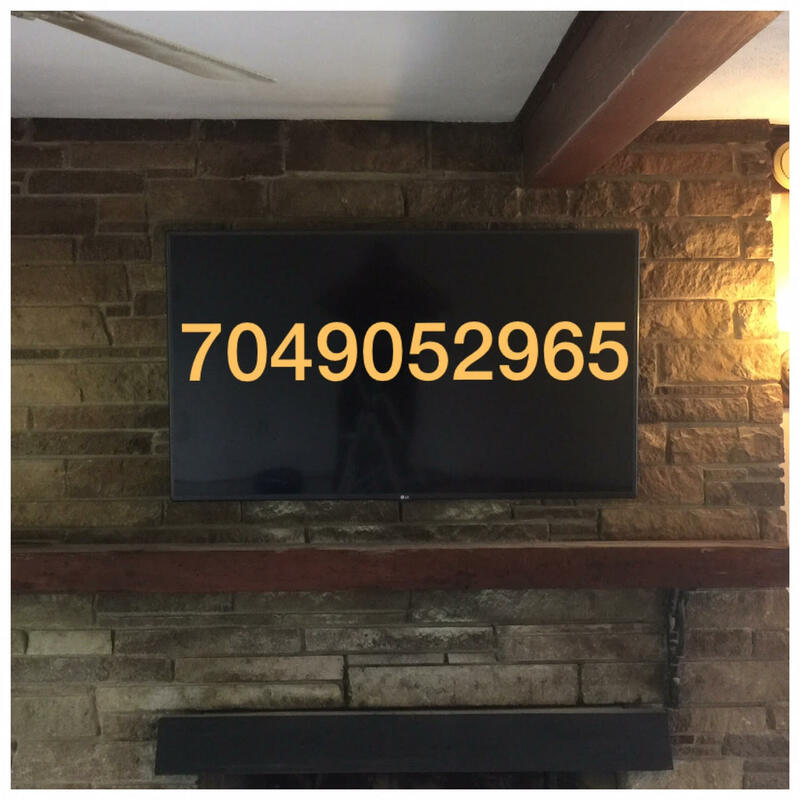 We have been professionally wall mounting televisions in Charlotte and the surrounding area for years and have seen many types of wall mounts customers and other TV mounting services use to install their expensive TVs. We do not use or recommend using any TV mounts with plastic parts because plastic can bend and warp. This may cause the TV installation to look crooked, un-level and unprofessionally installed. We strongly suggest using our TV wall mounts during installations when we encounter inferior and cheaply made TV wall mounts. 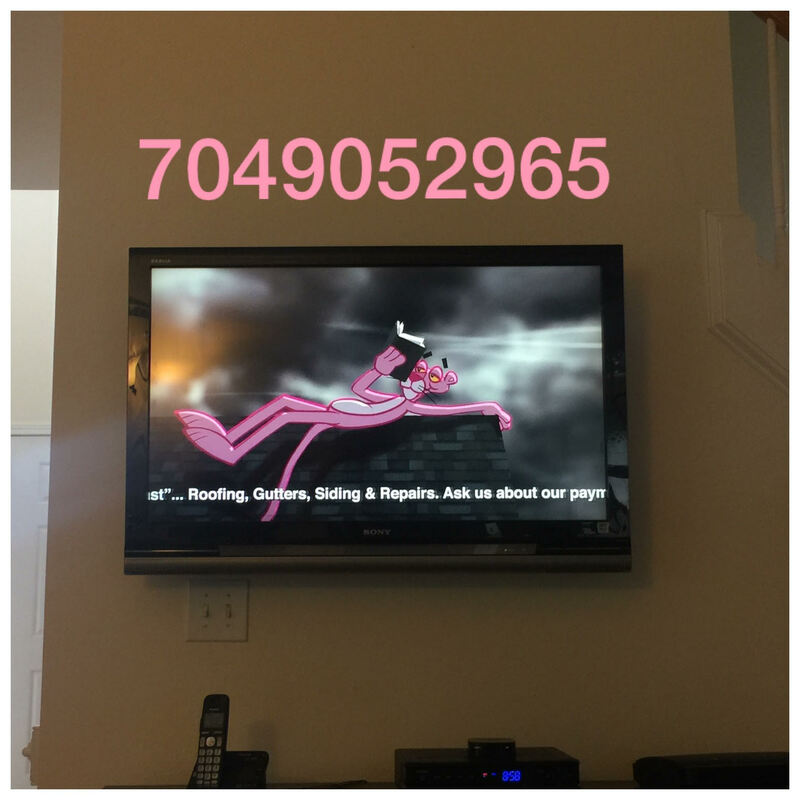 Whether you are moving within Charlotte or are completely new to the area, we will be glad to assist you with your TV mounting and home theater wiring services. We can schedule an appointment to un-mount your TVs at your old place and immediately re-install the TVs at your new address. We will be happy to use your wall mounting bracket and cables or ours if you need new ones. Appointments can be arranged to match your schedule and our average TV mounting service usually takes less than an hour. We don’t require help lifting most TVs so you can feel free to do whatever you need to do while we install your flat screen TV for you. We even offer discounts for multiple TV installations. 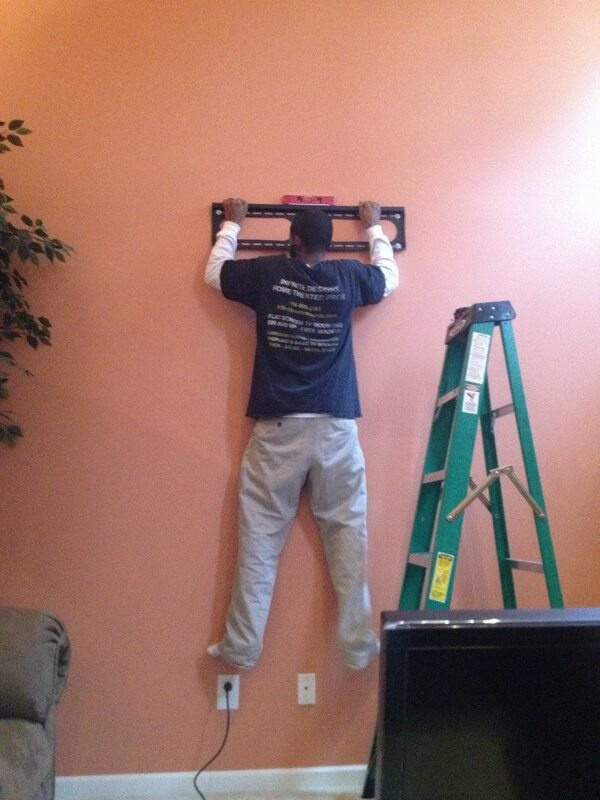 Get a free quote on all of our TV mounting services here. 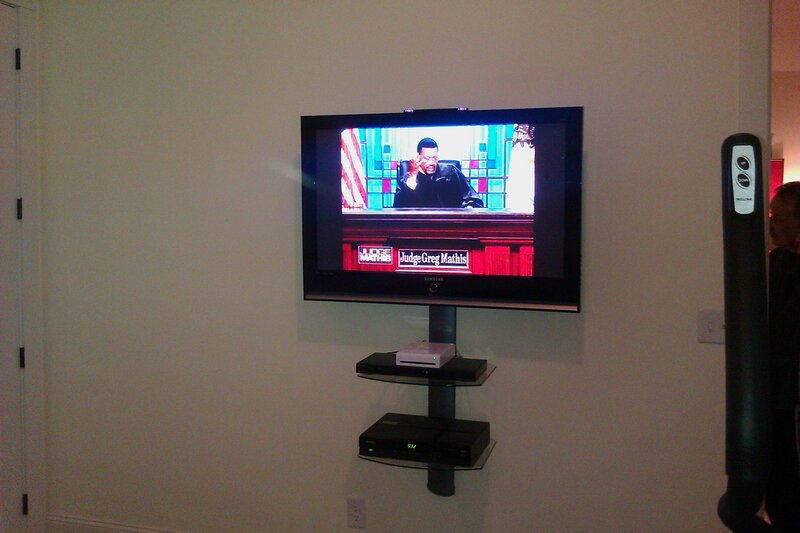 Own a small business or office and need professional TV mounting and flat screen installation services? Check out our commercial TV installation services! 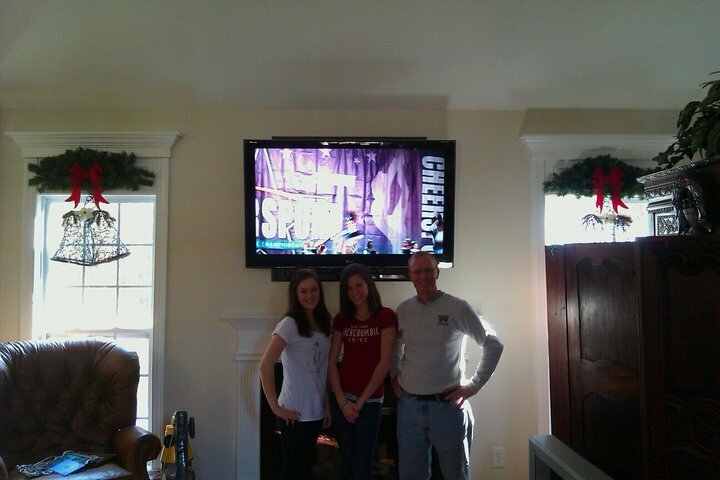 Our TV Mounting Gallery has numerous examples of each installation. 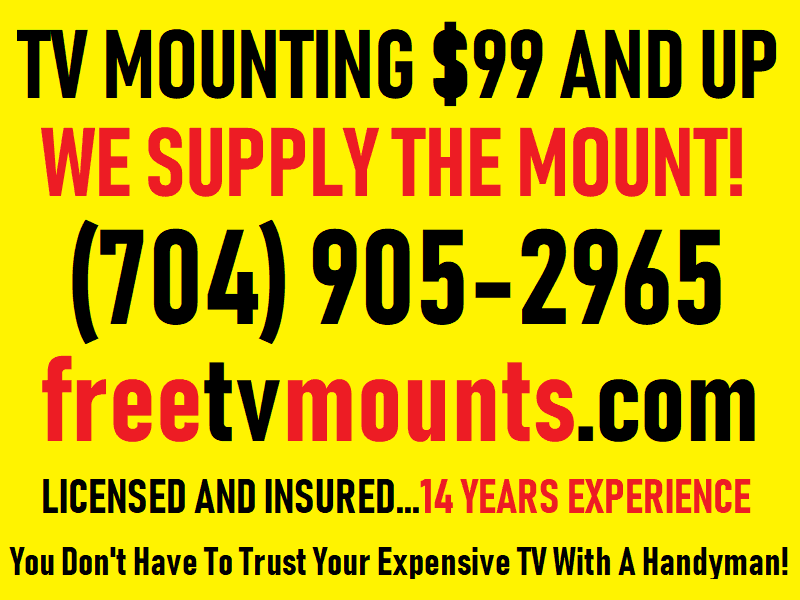 FREE TILT MOUNT INCLUDED WITH EVERY TV INSTALLATION!